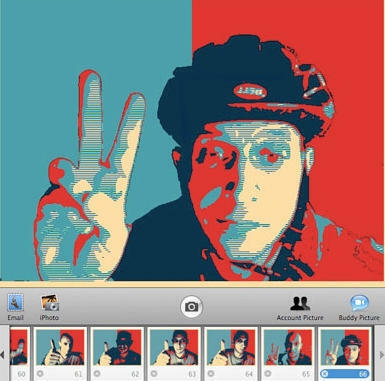 If you liked the red-white-and-blue look of the Barack Obama “Hope” poster designed by street artist gone viral Shepard Fairey, Dubi Kaufmann has made a plug-in for Photo Booth that allows you to “Obamafy” your photos. Download zip file here, then expand it. Copy the file Obamafy.qtz to /Library/Compositions, then launch Photo Booth and enjoy the Obamafy plugin. how do you make this work in tiger? Is there a Flickr group? Are Photobooth plugins Photoshop compatible? Or is there a photoshop plugin? The name is misleading. The powerful poster of President Obama was the distinct creation of Shepard Fairey. This plug-in should be called the Fairey “Obama Hope” plug-in, or something that incorporates the artist’s name. Thank you for writing about my pop culture experiment. dubista asked “how do you make this work in tiger?” -no. Robert asked “Is there a Flickr group?” -not yet. Susan Kitchens asked “Are Photobooth plugins Photoshop compatible? Or is there a photoshop plugin?” – Photobooth plugins are not Photoshop compatible and I did not make a photoshop plugin. Bill said that “The name is misleading. The powerful poster of President Obama was the distinct creation of Shepard Fairey. This plug-in should be called the Fairey ÃƒÂ¢Ã¢â€šÂ¬Ã…â€œObama HopeÃƒÂ¢Ã¢â€šÂ¬Ã‚Â plug-in, or something that incorporates the artistÃƒÂ¢Ã¢â€šÂ¬Ã¢â€žÂ¢s name.” -That would be long and confusing. I mention and link to shepard Fairey’s site. Cute! I can add one in my outgoing mail. This did not work for me. I put the file into the Composition folder and started up Photo Booth, but do not see the effect. Is there anything else you have to do? I expected it to be in the 3rd “tab” after the strecth, squeeze, etc effects.